Charming, young and stylish, Leonore is the daughter of legendary theater actor Anton Karidian. Together they tour through the galaxy performing Shakespeare plays. At first Kirk romanced Leonore as a way to gain more information about her mysterious father. But he quickly falls for Leonore’s charms - preventing him from seeing her real character. Knowing he can't resist a damsel in distress, Leonore is perhaps the first woman to use Kirk’s favorite distraction-by-seduction trick against him. Let's talk about Leonore's costumes. 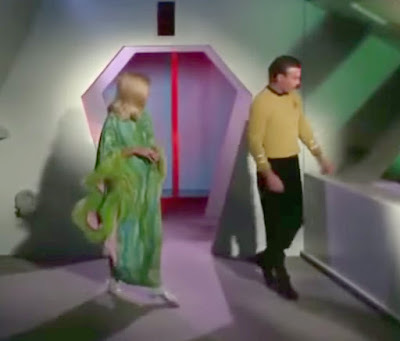 Star Trek characters rarely have costume changes. Star Trek was a show perpetually short on cash and on time, which is why they frequently re-used props, costumes and sets. But Leonore has a whopping six costume changes! 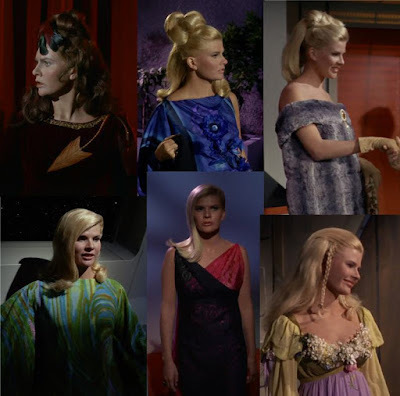 When I started this project, I made a rule that if a character had multiple costume changes, I would depict her in the most interesting and Star Trek-y one. But all of Leonore's costumes are pretty interesting. 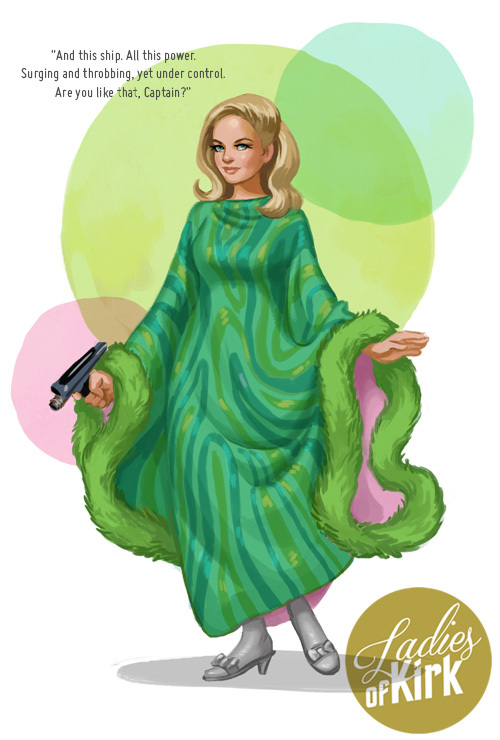 I chose to draw her in her green chiffon gown, because I felt like it was the most typically Star Trek, with its groovy pattern, ridiculous feathered trim, pink satin lining and sparkling leggings. I'm not sure if I made the right decision, though. Her strapless chinchilla tube was a close runner-up. Next up: Lieutenant Shaw, the Power Lawyer.